Two supermassive black holes are about to collide before our very eyes, and scientists are watching with amazement. It’s the big scientific discovery of the week: two supermassive black holes have been spotted circling each other billions of light-years away, about to collide in a spectacular show unlike anything scientists have ever seen — and it could help them learn more about this incredible cosmic phenomena. Two supermassive black holes were recently spotted circling each other at a distance of one light-week, which is about the width of our solar system, meaning that they will soon collide and reduce huge amounts of energy. It is an incredible event that scientists have never witnessed. The black holes were spotted in the Virgo constellation billions of light-years away, and they were able to determine there were two of them because of two quasars that were close to each other. Black holes are a fascinating subject: they featured prominently in the blockbuster hit “Interstellar.” But what you may not realize is just how many fascinating facts there are about black holes, according to Universe Today. 1. Black holes are invisible to the human eye. That black hole sure was amazing in the film Interstellar — what? You can’t actually see a black hole? That’s correct, and Interstellar does actually play with that concept. After all, it appears as a giant black object, with any light that you could see spinning around. Black holes are so gravitationally powerful that nothing — not even light — can escape it. 2. There’s one at the center of every universe — including ours. Did you know we are circling a giant black hole even now? It’s true. Although we are technically circling the sun, our sun is actually part of billions of stars in the Milky Way that is circling around that supermassive black hole at the galaxy’s center like a drain. 3. A black hole is formed when a star collapses. Stars burn for a very long time, but what happens when they lose all their energy? They collapse and form a black hole. Usually, this happens with very large stars — say 20 times the size of our sun. With a star the size of our sun, it would simply fade into a white dwarf when it runs out of energy, but bigger stars have something different happen: gravity suddenly overwhelms the natural pressure the star maintains, and it collapses, causing gravity to suddenly overwhelmt he core and all the layers are flung into space in a spectacular explosion called a supernova. What remains is a singularity, or a spot of infinite density with almost zero volume, also known as a black hole. 4. Black holes aren’t all the same size. Some black holes are relatively small — although still epically huge by our standards — and some have swallowed up lots of stars and other black holes to become supermassive — so big that they attract millions or even billions of stars to circle them, forming galaxies. 5. Black holes cause changes in the fundamental fabric of space-time. 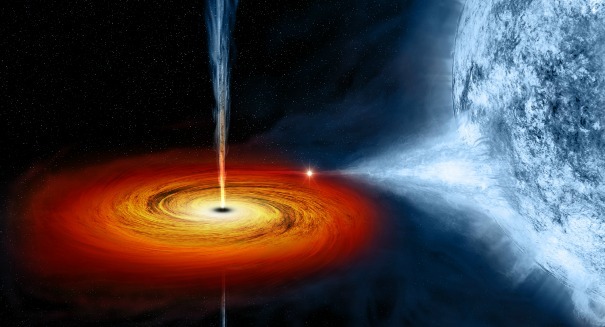 Falling into a black hole would not only be deadly, it would completely alter time. A person falling in would see his clock ticking more and more slowly, which falls in line with Einstein’s theory of general relatively where time is not a constant, but is affected by your speed. A black hole changes time and space so much, that it makes time seem to slow down, although it hasn’t changed at all. 6. We didn’t discovery black holes until X-ray astronomy first burst onto the scene back in the 1970s. Cygnus X-1 was the first black hole to be discovered, and it was found during balloon flights in the 1960s. Still, it hadn’t been pegged as a black hole under about a decade later, where they found that it was actually a black hole that was 10 times the size of the sun. A nearby giant blue star that was 20 times the size of the sun was being sucked gradually into the black hole, resulting in X-ray emissions that could be detected. 7. Don’t worry, the nearest black hole is nowhere near us. A few years back, V4641 was inadvertently reported to be just 1,600 light years away — still quite a distance, but a rather surprising find. However, more research indicates that the person who estimated that distance was way off. New estimates released last year indicates it’s actually about 20,000 light years. That’s quite a bit more breathing room. 8. Black holes actually aren’t dangerous … as long as you keep your distance. Black holes are perfectly fine to observe as long as you don’t reach the event horizon, which is where the gravity becomes inescapable. This is also called the point of no return, when there’s no hope of you being rescued. However, outside of this, you’re fine. This is why it’s not possible for black holes to simply gobble up everything in the universe.